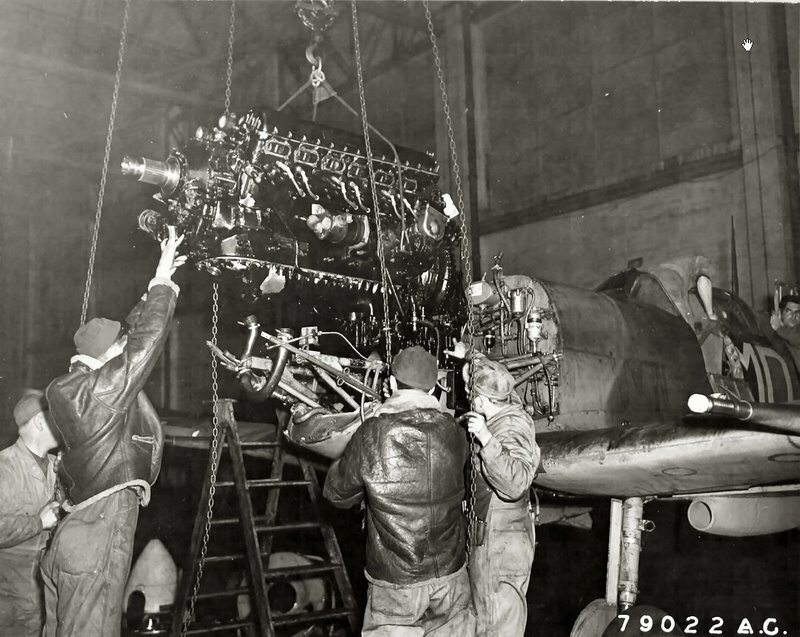 Mechanics of an American Fighter Group dismantle a Rolls-Royce Merlin 45 engine from a Spitfire Mk. V, an operation which required a crane. The photograph has been taken at the USAAF Fighter Station in Audley End, England in April 1943. Can anyone help identifying the unit? Looks Like MD which would be RAF 133 squadron formed on August 1, 1941. Tragically the entire squadron was lost on a mission on Sept. 26, 1942. All left over equipment -including the ship pictured- was transfered to 336 SQ, 4th FG, USAAF shortly after. Those are all probably Yanks working on a “survivor”. Those are Americans… my guess would be the US 4th Fighter Group as they used Spitfires until transitioning to P-47s.